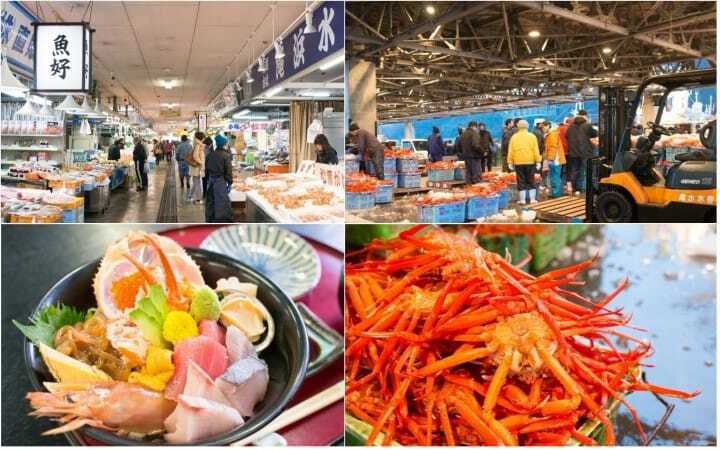 https://matcha-jp.com/en/5560 Tour The Sakai Fishing Port - Delicious Seafood And Fun Workshops! Tour The Sakai Fishing Port - Delicious Seafood And Fun Workshops! Sakai Fishing Port in Sakaiminato, Tottori, boasts the top landing load of wild tuna and red queen crab in Japan! Read on to learn about a unique tour of this fish market, which allows you to taste delicious dishes made with fresh seafood. Sakai Fishing Port, located in Sakaiminato in the western area of Tottori prefecture, is one of the most prominent fishing ports in Japan, as it boasts the biggest catches of wild tuna and red queen crab. But some people may wonder, what is there to see at a fishing port? This port has many appealing points of its own, such as the restaurants serving exquisite seafood dishes and shops handling marine product souvenirs located nearby. Also, visitors can participate in a unique tour. Watch the Fish Auction Up Close! At Sakai Fishing Port, an "osakana" (fish) guide conducts the Sakaiminato Fish Market Tour, in which the participants can actually watch the fish auctions. Some of the readers may have heard about the Tsukiji Fish Market (*1) in Tokyo, which is said to be the largest wholesale fish market in the world. Visitors can watch the fish auctions, and it has become a popular spot for tourists from abroad. At Sakai Fishing Port, visitors are also allowed to see the daily routine of a fish market. *1: The fish auction at Tsukiji Market is scheduled to move to Toyosu, Tokyo, in 2018. Tsukiji is a market where fish from various Japanese ports are gathered, and sent to consumers all over Japan. On the other hand, Sakaiminato Fish Market is directly connected to a fishing ground, so the visitors can watch the fishing boats unloading their catch. The catch is transferred from the boat in a huge net to the trucks standing by, which is truly an impressive sight. Just like Tsukiji, the brokers come to this market to participate in the auction. Freshness is key when it comes to marine products, so they rush to load their own trucks after they make their purchases. Forklifts filled with various marine products race around in the port, which also adds to the bustling atmosphere. This fish market tour has become popular with visitors from abroad. It is especially popular with those who come here after seeing the urban areas; many have expressed awe at the sight of live fish and crab being packed into the crates. To participate in this tour, send an e-mail to Sakaiminato Association for Promotion of Fisheries (suisan@joy.ocn.ne.jp). For further details, please check the information below. The tour will be held early in the morning, so staying at a hotel in Sakaiminato overnight is strongly recommended. The guide will speak simple English, but it might be better if the visitors participate with someone who can translate the commentary. Business Time 7:00 - 7:50/ 9:00 - 9:50/ 10:00 - 10:50 **The tour will be held three times a day, if there are more than two participants per tour. Please note that only ten people can participate in the 7:00 tour. Up to thirty people can participate, respectively, in the other two tours. Reservations for all the tour must be made two days in advance. Fixed holidays Sundays and National Holidays. There are also no tours from August 12th to 17th, and from December 2nd to January 10th. Menu/Pamphlets in Other Languages Original Chinese Characters and Korean. Access From the JR station, it is a 25 minute walk, or a five minute taxi ride to the fish market. Visitors can also ride the bus from the JR Station, which takes about ten minutes. The nearest bus stop is "Sakaiminato Suisanbutsu Chokubai Center/ Sakaiminato Kowan Godo Chosha." Price 300 yen per person. Telephone number +81-859-44-6668/ Or send an English e-mail to suisan@joy.ocn.ne.jp, with a mobile phone number which can be reached in Japan. From the port, it takes only a minute to walk to Sakaiminato Seafood Direct. Fresh Matsuba crab and voluminous red queen crab, brought straight from the port, can be purchased at reasonable prices. It might be fun to stay at a guesthouse and make some seafood dishes. At Seafood Direct there are tanks filled with live crab and fish, so visitors can also enjoy watching them swimming around. Kaiyotei is a restaurant inside the Seafood Direct, and their recommended menu is the special kaisendon (a large bowl of rice topped with fresh seafood). It is a gorgeous dish filled with prawn, tuna, crab and squid, the fresh colors of which look almost like jewels. Those who aren't used to raw seafood should try the Ebi Fry Teishoku, a set meal with fried prawns as the main dish. Fixed holidays Tuesdays. Please note that some stores will be open on Tuesdays. Access From the JR station, it is a 25 minute walk, or a ten minute taxi ride to the Seafood Direct. Visitors can also ride the bus from the JR Station, which takes about fifteen minutes. The nearest bus stop is "Sakaiminato Suisanbutsu Chokubai Center/ Sakaiminato Kowan Godo Chosha." From Sakaiminato Station, it takes about 10 minutes by taxi to reach Tairyo Fish Market Nakaura, a souvenir shop which mainly handles marine products. A huge statue of Gaina Kitaro, standing 7.7 meters tall, welcomes the visitors at the entrance. This has also become a popular spot to take photographs. Nakaura handles processed marine products, along with various local snacks. Their most popular products are the seafood chips, which are manufactured on site. Made from prawns and sardines, these chips contain no artificial additives, and can keep for a month, which makes them a great souvenir for those who are on a long vacation to bring back home. Restaurant Yumigahama is located inside Nakaura, and kani toro don (a large bowl of rice topped with crab and ground Chinese yam), its original menu item, has become very popular. Kani (crab) meat is placed on top of rice, and served with tororo (ground Chinese yam) and soy sauce. The delicate taste of this dish is a hit with many visitors to Japan. Nakaura also sells kani toro shumai, a steamed dumpling made with tororo and crab meat. It has to be kept in a refrigerator, so the shumai should be eaten right after the purchase. Access Ten minute taxi ride from the JR station. Sakaiminato Sakana Center is connected to the Yumeminato Tower, a landmark located a ten minute walk from Nakaura. Fishmonger shops are lined up inside the center. At the Sakana Center, visitors can purchase seafood and have it prepared on the spot. The fish will be sliced into perfect sashimi sets, and the crab shells will be opened to make them easier to eat. There is a dining area inside the center, where visitors can enjoy a seafood barbecue in some seasons. Dried food made from various types of shellfish is also popular at the Sakana Center. The recommended menu item at the restaurant Minatotei, located inside the Sakana Center, is the tempura kani teishoku (a set meal with tempura and crab). It comes with rice, miso soup, fresh seafood tempura and red queen crab. Red queen crab fishing is prohibited in July and August, so during that period, voluminous servings of rock oysters are available instead of crab. From Minatotei, visitors can also enjoy the great view of the Yumigahama Beach, along with the fine food. At Mizuki Shigeru Road, located near Seafood Direct, visitors can wander into the animation world of Ge Ge Ge no Kitaro. Yumigahama Beach can also be viewed from the Yumeminato Tower, which is located near Nakaura and the Sakana Center. From JR Yonago Station, it is a forty minute train ride to Sakaiminato Station. Inside the Sakaiminato area, it's a good idea to use either a taxi or buses to get around. For information regarding transportation, please check the Sakaiminato Sightseeing Guide. For more information, check out MATCHA's Tottori prefecture section here. The Charms Of Eastern Tottori - Beautiful Places, Cuisine, Access And More! Central Tottori Sightseeing Guide - Historical Sites, Local Food And More! Toyosu Market Guide - Fish, Popular Shops, And Things To Know! Sapporo's Nijo Fish Market - Enjoy The Freshest Seafood In Japan! Tsukiji - 7 Places To Visit: Tsukiji Fish Market, Sushi, Tuna Auctions And More! Reasonable Flights - Don't Miss Out On 7 Must Try Things In Tottori!